Travelling independently via Surat Thani city, and taking a public bus from there to Krabi town. Using a direct service from Koh Samui to Krabi town including all ferry and bus connections. 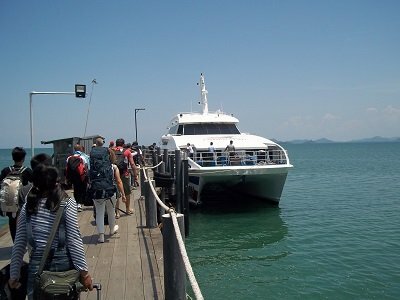 The travel times are the point when the ferry departs from the Pier in Koh Samui to time the connecting bus service arrives at its final destination. The Phantip Travel service is the the cheapest way to get from Koh Samui to Krabi. The Lomprayah service is the fastest service. Use the Search Box below to buy ticket on a direct ferry and bus service from Koh Samui to Krabi. What makes a ‘direct service’ different to travelling independently is that it takes you from point to point by ferries and then bus from the ferry pier, cutting out the need for passengers to make their own way between the ferry port and the nearest bus station. The cheapest way to do the journey is to take the car ferry from Nathon in Koh Samui to Donsak ferry port. When you buy the ticket ask for a transfer from Donsak to Surat Thani city. From Surat Thani there are frequent buses and minivan services to Krabi. The total journey time is 7 to 8 hours after departure from Koh Samui and it will cost 400 to 700 THB depending on which bus and ferry services you use. This is only slightly cheaper than taking a direct service and few people choose to travel independently rather than taking a quicker and less hassle direct service. This service departs from the Na Thon Lomprayah ferry pier. Nathon is the administrative capital of the Island. You can reach Nathon via the main ring road on Koh Samui. By shared pick up truck taxi the journey takes around 40 minutes from Chaweng and 30 minutes from Bophut. The journey can be done more quickly by taxi. The Lomprayah service to Krabi departs from Na Thon Pier in Koh Samui. This service leaves from Brangrak Pier which is close to the airport and 5 minutes drive from Bophut, and about 15 minutes drive from Chaweng. Shared pick up truck taxis go past the pier although they are less frequent than the services which go around the island’s main ring road. The Seatran Discovery service to Krabi departs from Bangrak Pier in Koh Samui. This service departs from Koh Samui bus station. Phantip Travel run two services a day with a number of stops on route. The 07.30 departure stops at Krabi Sea Pearl Office, then Ao Nang, then Ao Nam Mao Pier (for boats to Koh Phi Phi), before terminating at Krabi bus station. The Phantip Travel service to Krabi departs from Koh Samui bus station. Lomprayah Service: This service terminates outside the Lomprayah Office on Soi Maharaj, which is the main road through Krabi Town. Many shared taxis, including one which go to Ao Nang, stop near the Vogue Shopping centre which is also on the Maharaj Road only 600 metres away from the Lomprayah Office. Seatran Discovery Service: This service terminates at the Seartran Discovery office on Soi Seebaramee 1, which is just off Soi Maharaj and near the centre of Krabi Town. for onwards travel, including to Ao Nang, take a shared pick up truck taxi from the Vogue Shopping centre on Soi Maharaj, it’s only 500 metres walk This service departs from the Seartran Discovery office on Soi Seebaramee 1, which is just off Soi Maharaj and near the centre of Krabi Town. To get there by public transport, including from Ao Nang, take a shared pick up truck taxi to the Vogue Shopping centre on Soi Maharaj and walk 500 metres upto the Seatran Discovery office away from the Seatran Discovery office. Phantip Travel: The final destination for the Phantip Travel service from Koh Samui is Krabi bus station, although it may be more convenient for some passengers to disembark the bus at Ao Nang Beach or Ao Nam Mao Pier (for Koh Phi Phi).